Regions are geographically defined areas, such as river basins, that can be characterized in terms of their condition. 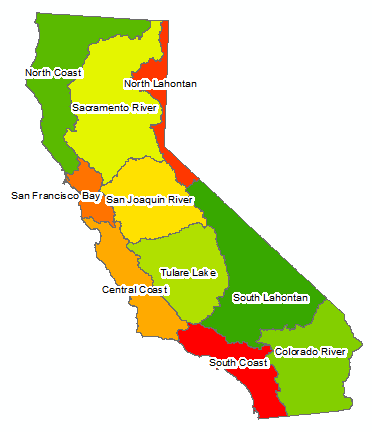 Indicators were evaluated for hydrologic regions, river basins, watersheds, and sub-watersheds. You can navigate regions (e.g., Tulare Lake) using the links in the menu on the right and view the scorecard for each region and sub-region.